The luminous paintings of Ann Phong incorporate mixed-media elements and thickly-impastoed paint in her weaving of personal and collective storytelling. As seen before in the artist’s previous works, Phong conveys the ocean as a site of tumult, fragility, and power as well as a source of wonder, and a overarching symbol of humanity’s impact on the planet. Phong received her Master of Fine Art degree in 1995 from Cal State Fullerton, has been exhibited nationally and internationally and is a current adjunct professor of art at Cal State University Pomona. Artist Cao Ba Minh’s paintings express interior states told abstractly through the elements of contrast, color, form, texture, and composition. The paintings’ transformation of its elements into expressive works highlight the artist’s ability to express complexity in a direct and simplified way. Having fled Saigon in 1991, Minh has been concerned about the value of expression as it relates to state censorship. The artist recently participated on a panel sponsored by the Rockefeller Institute on the cultural consequences of oppression and violence, in the context of artistic expression. 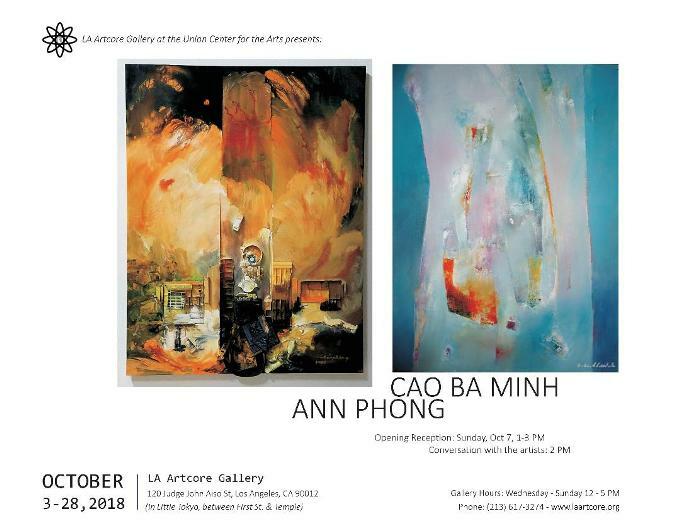 Minh’s work was recently acquired by the Vietnam Veteran Art Museum in Chicago, the Institute Francais and German institute located in Saigon, Vietnam.